MASVINGO Minister of State for Provincial Affairs Shuvai Ben Mahofa has died. 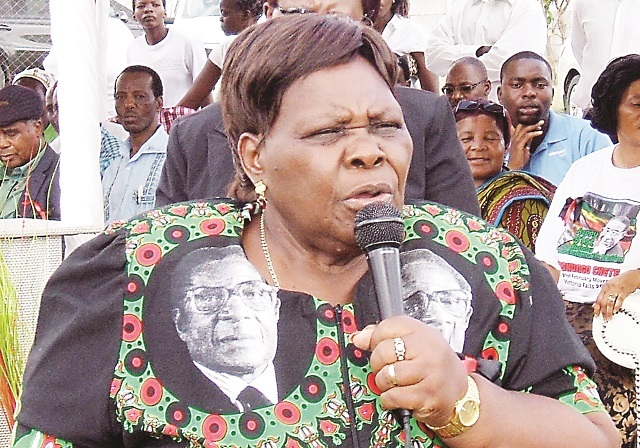 Minister Mahofa (75) collapsed at her home in Masvingo early yesterday morning and was rushed to Makurira Memorial Clinic where she died at around 3:30 AM. The late minister had been in Government since 1980, starting off as Deputy Minister of the then Ministry of Youths and Women Affairs before being Zanu-PF MP for Gutu South for many years. She was appointed Masvingo Minister of State for Provincial Affairs in 2015 after the dismissal of Mr Kudakwashe Bhasikiti-Chuma for being part of axed former Vice President Dr Joice Mujuru cabal. Minister Mahofa was a Zanu-PF Politburo member and at the time of her death she was also the secretary for security in the Women’s League. “We are sorry we heard early this morning from Cde (Happyson) Bonyongwe that Mai Mahofa died all of sudden. She was a member of the Politburo from Masvingo. At the last meeting of the Politburo, as I always do, I asked her how do you feel now? She said, ah, no, I am okay. The news is astonishing, as astonishing as it is sorrowful. “Let us not think that as we move along, we are totally healthy. See a doctor as often as possible, get checked as often as possible and ensure that at least from the report that you get you still are strong and healthy,” President Mugabe said. Speaking during the commemoration of Heroes’ Day at Masvingo Heroes Acre yesterday, Psychomotor Activities in Education Minister Josiah Hungwe described the late minister as a dedicated politician who loved her party, was hands-on and believed in doing things than talking for his province. “We are poorer as a province without Mahofa. She was a strong party cadre whose knowledge of politics was second to none. She stood resolutely in defending her province and we are going to miss her,” said Minister Hungwe who is also Chivi and Mwenezi senator. Deputy Masvingo Provincial Administrator Mr Gorden Chipika expressed shock at Minister Mahofa’s death saying on Saturday afternoon she was jovial and looked healthy. “I was shocked to receive the news of her death because she looked well on Saturday. We have lost a lady who wanted to see the emancipation of less privileged people in Masvingo. She was also instrumental in making sure that Tokwe-Mukosi is complete and people start to benefit,” said Mr Chipika. Zanu-PF Masvingo chairman Cde Ezra Chadzamira said he was at a loss for words, adding the vacuum left by Cde Mahofa would be difficult to fill. “Our Minister of State who was a pillar of strength in our party has left a big gap in the province. I personally depended on her on a number of issues and I benefited a lot from her advice,” said Cde Chadzamira. The Minister of Rural Development, Promotion and Preservation of National Culture and Heritage Abedinico Ncube yesterday sent his condolence message to the Mahofa family. “We are really saddened by the loss of Cde Mahofa. She was a very dedicated cadre of the party who fought for its liberation. This is not only a loss to the Mahofa family but to all of us as a country. May they find comfort and know we are together in this time of their bereavement,” said Minister Ncube who is also the Minister of State for Matabeleland South Provincial Affairs . Midlands Provincial Affairs Minister Jason Machaya described Minister Mahofa as a dedicated and loyal citizen who served her country with distinction. “We are saddened by the death of Cde Mahofa. She served for a very long time in the party and we worked together. She would always help us in doing our work. Yes, she was ill but when we last saw her in Parliament during the amendment of Constitutional Amendment Number 1, she was jovial. As Midlands, we are at a great loss and still in shock as we are trying to come to terms with her death. “We have lost a mother. She was a national patron for cross border traders and would encourage youth in whatever they would do in order to develop the country. Her death has landed us a devastating blow. We have lost immensely as a province. She was always there for us as Masvingo province. This is not something we would easily recover from as we are still in shock following her death,’’ Cde Zivhu said. Bulawayo Metropolitan Provincial Affairs Minister Cde Nomthandazo Eunice Moyo described Minister Mahofa’s death as unfortunate. “She was an old cadre of Zanu-PF and we worked together since the Unity Accord. She was a wonderful person and she was not scared of anything. Zimbabwe has lost one of the most hard working and loyal citizens who fought tenaciously for the country’s best interests. Farewell Cde Mahofa,’’ Cde Moyo said. Mourners are gathered at Minister Mahofa’s home in Rhodene, opposite Masvingo Agricultural Show Ground. Details about the funeral arrangements are yet to be announced.